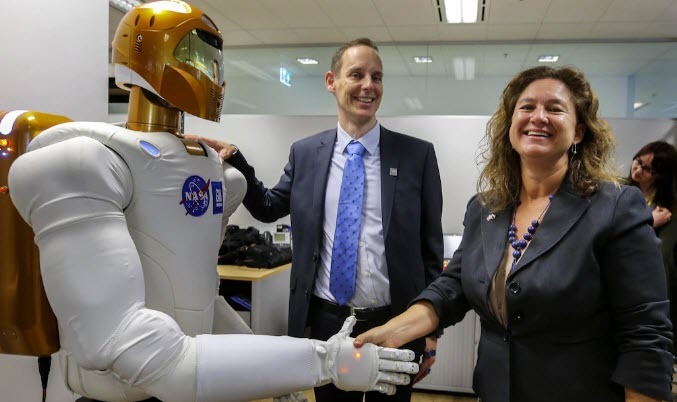 Photo: A NASA robonaut, R2C3, shakes hands with US Consul-General Rachel Cooke in a handover to the one of the robonaut's new bosses, Woodside chief technology officer Shaun Gregory standing in the background. R2C3 will soon be put to the test in the extreme and dangerous offshore oil and gas mining environment of Western Australia. The 21st century technology revolution continues to gain pace as humanoid robots are becoming ever more sophisticated. In a handover ceremony in June 2017, NASA has recently lent one of its most sophisticated and dexterous robots to an oil and gas mining company in Western Australia which will shake up the industry. The humanoid will be tasked with undertaking some of the most dangerous manual jobs on offshore drilling platforms. Photo: A picture of a Shell Floating Oil and Gas Platform, compared to the size of a USA Aircraft Carrier. These Oil and Gas Platforms in Australia are the largest ships in the world, which are six times the size of an aircraft carrier. In fact the weight of a fully loaded aircraft carrier would only be the weight of the ballast for one of these oil and gas rig platforms. New NASA robots will operate in and be put to real world testing in such environments in Australia which will prepare them for their space missions. This is not only a technology revolution, but also a major labour revolution. The use of robonauts makes operating costs far cheaper compared to humans who require expensive salaries to do the same work. For example, a robonaut may be able to do the job of an entire elite team of humans who would require to be helicoptered in during emergency situations. Governments around the world may now need to consider taxing robots to make up for lost personal income taxes from human workers who are being replaced by the robots. This income tax could be applied to the company which operates robots. Photo below: Mars is on the horizon for these humanoid robots. Their training in the harsh environments of Western Australia will give them good experience for their mission to Mars. NASA also benefits from this in a win-win game for everyone. Australia is the only place in the world outside USA to use these robots which will test the robots in extreme and dangerous workplace environment. This will be great robonaut training for when NASA sends the robonauts to the planet Mars in the near future. Canberra, Australia, is a location for one of NASA's three deep space command and control centres, which will be communicating with such robots in their near future solar system journeys.